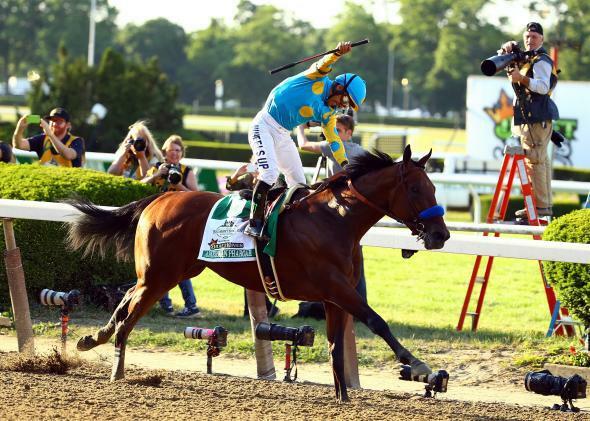 American Pharoah is first Triple Crown winner since 1978. Victor Espinoza, celebrates atop American Pharoah #5, after winning the 147th running of the Belmont Stakes at Belmont Park on June 6, 2015 in Elmont, New York. It wasn’t a last-minute push that did it. In fact, by the middle of the race, trainer Bob Baffert already knew American Pharoah was going to finally end a long 37-year wait. “The crowd was just thundering and I was just enjoying the crowd and the noise and everything happening,” Baffert said, according to the Associated Press. “What a feeling.” The lack of suspense was due to a simple reason: It wasn’t even close. American Pharoah ended up winning the Belmont stakes by 5 1/2 lengths on Saturday and became the first horse to win the Kentucky Derby, Preakness, and Belmont Stakes since 1978. It had been so long since the Triple Crown had been won, and there had been so many disappointments, that some even dared to wonder whether it could be done anymore. Maybe the three-race spree was too much for today’s horses, some would say. And now that the feat has been achieved, sports writers are falling over themselves to sing American Pharoah’s praises. The first Triple Crown winner in 37 years will be remembered for that signature sense of supple ease, the limber mobility that made something so difficult seem so natural. His 5 1/2 –length victory in the Belmont Stakes was visually striking for the amount of air between him and his inferiors, and between his hooves and the ground. All week trainer Bob Baffert had talked about the good “vibe” around his horse, and that’s what he ran like, a weightless emanation that left a crowd of 90,000 roaring with appreciation, not just because they were lucky enough to see history, but because he was beautiful. If you’re going to have to wait 37 years for a piece of sports history, this is exactly the way it should happen: with a majestic and unforgettable performance that even a nervous trainer could allow himself to sit back and enjoy. American Pharoah won the Triple Crown in stunning style, leading wire-to-wire over the long, 1 1/2–mile Belmont track, kicking into high gear in the far turn, just as he did at the Preakness, to win by 5 1/2–lengths over Frosted. It was the third-largest winning Belmont margin for a Triple Crown winner, behind Secretariat’s 31 lengths in 1973 and Count Fleet’s 25 in 1943. Now there’s a 12th name on the list of Triple Crown winners, American Pharoah. He didn’t luck into this, he didn’t beat an inferior collection of rivals; there was nothing fluky about anything he did over these past five weeks. He accomplished what some had thought could not be accomplished because he is a great horse, one worthy of joining a club that accepts only immortals. As a new legend is born, there’s optimism that American Pharoah will manage to increase interest in the sport.